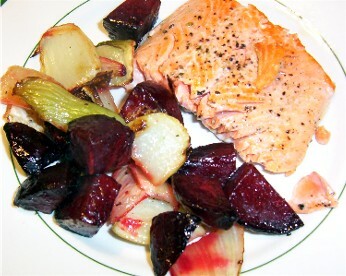 Saturday night’s dinner was pretty exciting (and filling), so I made us a “recovery” dinner for Sunday, just a fillet of wild-caught sockeye salmon, pan-seared in olive oil, and a head of fennel and some beets, cut up and roasted in the oven. It was beautiful, fresh tasting and sweet, and it turns out that salmon and fennel are really good together (note for future experiments). Of course, we may have undone some of the good of this dinner by also baking up the rest of the gougères and eating them all. Whoops.